For other places with the same name, see Slobozia (disambiguation). Slobozia (Romanian pronunciation: [sloboˈzi.a]) is the capital city of Ialomița County, Romania, with a population of 48,241 in 2011. The city was founded on the site of a village by the name "poor". During the Tatar invasion, it was attacked and conquered. In order to keep the villagers in the settlement, the rulers of Wallachia withdrew some taxes. This explains the city's name, which comes from the Romanian word of Old Bulgarian origin "ѕlobozie", which means "free village from taxes." Slobozia lies roughly in the middle of the county, on the banks of Ialomita River, at ca. 120 kilometres (75 miles) east of Bucharest and 150 kilometres (93 miles) west of Constanța, important port at the Black Sea. 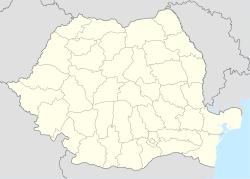 The city is within 17 kilometres (11 miles) of the Bucharest-Constanța A2 Motorway (Autostrada Soarelui). The total area of the municipality is 126.72 km2 (31,313.19 acres). In the present administrative form, Slobozia consists of Slobozia proper and the neighbourhoods of Bora and Slobozia Nouǎ. The main activity in the area is agriculture, processing of the agricultural products and light industry. Traditional costume of the Slobozia region. In 1990 the Cultural Centre was inaugurated, bearing the name of the conductor and composer Ionel Perlea, a city native. The building houses exhibition and performance rooms, bookstores, cultural institutions. In 1999 the Cultural Centre Ionel Perlea entered the UNESCO circuit. The city is the headquarters of the Romanian Orthodox Diocese of Slobozia and Călărași, established in 1993. At the 2002 census, 97.6% of inhabitants were ethnic Romanians and 2.2% Roma. 98.6% were Romanian Orthodox, 0.4% Seventh-day Adventist and 0.2% Roman Catholic. Its name is from Romanian "slobozie", which meant a recently colonized village which was free of taxation. The word itself comes from the Slavic word "slobod" which means "free". As it is located in the middle of flat land (Bărăgan Plain), it was very vulnerable to Tatar and Ottoman incursions. To encourage peasants to settle there, they were exempted from some taxes, hence the name. The main tourist attraction consists of the nearby Lake Amara - 5 km (3 mi) away. Amara Resort is also a balneoclimateric resort. Access to Amara is by minibuses that leave every 15 minutes from the Slobozia Train Station. As part of a private tourist complex, there is a small copy of the Eiffel Tower 54 m (177 ft) high. Wikimedia Commons has media related to Slobozia.